Sunday was my 46th birthday. All in all it was an almost perfect day. Our son came home from college (not such a rare thing considering his college is only 15 miles away) and spent the weekend with us. Yesterday morning the three of us went to church, then to lunch at Ruth's Chris Steak House. A week ago I went to a product demonstration of some networking equipment and won a $200.00 gift certificate to Ruth's Chris in a prize drawing, so we used that to have a wonderful (and expensive!) birthday meal. The real surprise was when we got home and I walked in to discover some of my dearest friends waiting inside. It was a surprise party. We spent the afternoon together sitting in a circle talking about the things of God and, at times, engaging in spirited theological dialog. I can't think of anything I would have rather been doing. Lorna and Bill bestowed upon me the gift of a "genuine" Quaker hat. Someone said it makes me look like Gary Cooper in Friendly Persuasion. Lorraine, our pastor, was there and I told her that she was probably the only one present qualified to wear the hat (since she's been a Quaker all her life). She tried it on but reminded me that, as a woman, she would have worn a bonnet instead. The only picture I have handy is a grainy one taken with my cellphone. Someone else took better pictures with a real camera, which I'll post if I get them. 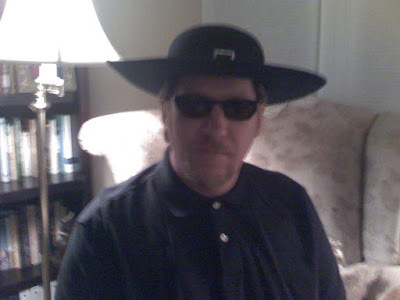 I don't think I'll be wearing the hat to Quaker meeting anytime soon, but I will put it on if Jehovah's Witnesses or Mormon's come to the door. A few years ago Raj, one of my students, invited Carla and I to his house for dinner. His parents were visiting from India and his wife was going to prepare a special dinner. At Raj's house, we all sat in the living room around a large coffee table. Raj's wife and mother began bringing out platter after platter of delicious Indian food. It was the most wonderful Indian food I had ever had. Soon I was stuffed. Then Raj announced, "And now for the main courses!" What had seemed to me to be a feast had only been appetizers! This experience came to mind this morning as I was pondering a popular movement of a few years ago called What Would Jesus Do? or WWJD. It was (I thought) a great movement, but it was also (I think) the equivalent of my mistaking Raj's appetizers for the main course. The question "What would Jesus do?" carries with it an implied assumption, which is "Since He's not here anymore." The assumption is that revelation of who God is, who Christ is, what God wants, etc., is fixed and set down in the scriptures. It is a frozen record of revelation. If one views the scriptures in this way; as the sole (or even primary) source of our understanding of God, then it becomes necessary to defend the inerrancy and infallibility of the scriptures. They are, after all, the authority upon which we base our Christianity. We study the scriptures and imbibe the teachings of various experts (actual or self-professed) on scripture and then we go forth into the world asking "What would Jesus do?" But what if there is more to the meal? What if, in addition to the fixed and documented record of revelation that scripture provides, there is also an ongoing, living revelation? Then WWJD becomes WIJD: What Is Jesus Doing? Just as the main course doesn't negate the appetizer, so the ongoing living revelation doesn't negate the scriptures. Rather, they complement each other. But where "the rubber meets the road" is in the living, moving, speaking God at work both within us and in the world. Our challenge and privilege is to ask "What is Jesus doing?" and then join in with Him. Clara Rockmore, the greatest thereminist of all time. Accompanied by Dame Edna on piano. I was in my 30's when my father died. He was 59. His death was sudden and unexpected. My father was an athlete who climbed mountains, ran marathons and, not long before his passing, rode his bike across the state of Iowa. He worked the night shift at the Denver Post. He came home from work early one morning, sat back in his recliner with a bowl of jello, and his heart simply stopped beating. It was determined to be a freak occurrence of cardiac dysrhythmia--his heart simply misfired and failed to recover. He probably never even realized what was happening. The idea that, at any time, my heart could skip in such a lethal manner has haunted me ever since. My mother found my father's body and called me. I rushed over to their house and knelt beside what was now clearly a cold and empty shell. I tried to take it all in. This was the first dead body I had ever seen, and it was my own vivacious father. I was overcome with grief and wonder at the same time. Perhaps I should command him to rise like Jesus did to Lazarus, I thought, but the leaden weight of death's finality crushed any hope or faith that might have momentarily flickered. The paramedics and police came to confirm that he was indeed gone and that no foul play had occurred. They were efficient, polite and professional. A police chaplain appeared and knelt beside me. He kept making small-talk and speaking platitudes. I wanted him to just shut up and eventually I asked him, politely, to leave. 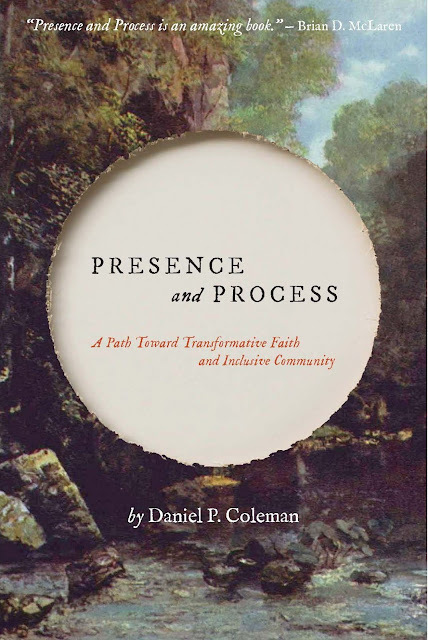 I wish he would have practiced what Quakers call "the ministry of presence", which is to simply be silently present. The coroners came, an older man and a younger man. They lifted my father's body from the recliner and placed him on a gurney, covering him securely with a sheet. I followed them as they maneuvered the gurney through the house, down the front porch steps and out to their van. With professional deftness they lifted the gurney into the back of the van, secured it, and closed the door. Then the older coroner turned to me. He placed his hand on my shoulder and looked me in the eye with a pure and intense sincerity that I can still remember vividly. There were tears in his eyes. "I will take care of him as if he were my own father. ", he said. And so my father passed into the hands of someone kind and compassionate. It was a great comfort to me. "There is an ongoing and widely documented policy of discrimination in planning and building, land expropriation, home demolition, the whole issue of revoking residency," said Sarit Michaeli of the Israeli human-rights group B'tselem. Israeli Cabinet minister Isaac Herzog said maintaining a Jewish majority in Jerusalem is a key government objective, but denied it has been pursued at the expense of the city's Arabs. "We believe in a Jewish majority in Jerusalem as such. It is the capital of the Jewish nation," Herzog said. He dismissed claims of discrimination of Arab residents as "absolute nonsense," but acknowledged the city's Arab neighborhoods received fewer government resources.